TREK LAUNCHED ITS FIRST REMEDY 29 LAST JUNE IN SEDONA, Arizona, which offered perfect terrain for the 140-millimeter big- wheeler. The bike rolled easily over square-edged rocks, maintained speed on smooth stuff, and kept its composure in the steeps. I probably would have been completely sold on the thing had I not ridden a different bike the day before. 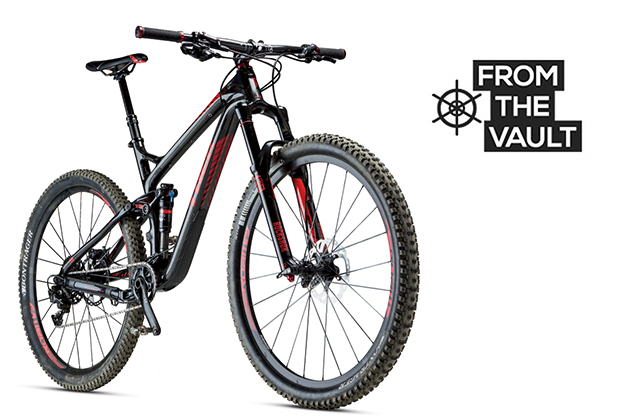 The Fuel EX, with its 120 millimeters of travel and steeper angles, is distinctively different than the Remedy's more all-mountain attitude. I thought I'd dig the bigger, burlier bike more, but the Fuel EX had a carbon frame and the Remedy didn't. The Remedy was perfectly capable, but the aluminum frame just didn't feel as nice as carbon. If you think this attitude sounds snobbish, just keep off the forums until you feel the difference yourself. Carbon isn't just blingier and lighter, it's much stiffer where it needs to be yet absorbs vibration better than aluminum. It is quieter, more comfortable and more responsive. My first ride on the new carbon fiber Remedy 9.8 29 reminded me how capable this line of bikes is, plus now it's much livelier, snappier and over a pound lighter. It's a markedly better ride. The bike scoots up hills just as well as the Fuel EX, but ups the ante on descents. I rode that bad boy you see in the picture above back-to-back with a bike that has a bunch more travel and significantly slacker angles, and shredded way harder with much more confidence on the Remedy. Not only that, but it was more fun to pedal uphill than the other bike too. Contributing to the responsive feel of the bike are two key technologies Trek introduced this summer: Re:Aktiv and Boost 148. Trek partnered with Penske Racing, a leader in Formula One suspension to develop the Re:Aktiv rear shock, which uses Penske's regressive valve. The shock opens so fast that it provides unparalleled bump sensitivity without the loss of pedaling support. It's like nothing I've ever ridden before. Boost 148 is a new rear axle spacing designed to allow stiffer 29-inch wheels by widening the hub flanges 3 millimeters on each side, giving a better spoke bracing angle. Trek claims that this change creates a 29er wheel that is as stiff as the same 650b wheel.